The Emory men’s basketball team won the University Athletic Association championship last weekend with a 92-82 win over Rochester, earning an automatic berth in the NCAA D-III tournament, where they compete Friday against Wittenberg University. Watch the Emory women's team take on Trine at 5 p.m. here. Watch the Emory men's team take on Wittenberg at 5:30 p.m. here. Emory men’s and women’s basketball teams both earned berths in their respective NCAA Division III national championship tournaments, with first-round games scheduled for Friday, March 1. 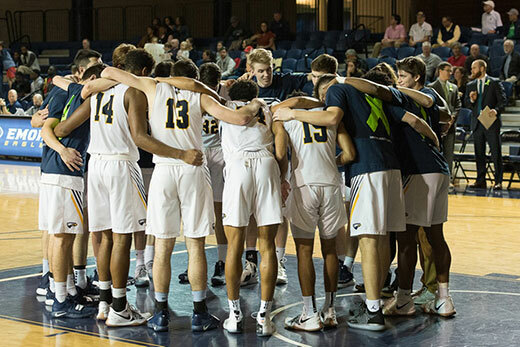 Led by head coach Jason Zimmerman, Emory’s men’s team was one of 43 programs to receive an automatic bid to the postseason after capturing the University Athletic Association title with a 92-82 triumph over the University of Rochester this past Saturday. The Emory men’s team will be making its seventh straight trip and eighth in program history to the NCAA Tournament. The Eagles will travel to Greensboro, North Carolina and the campus of Guilford College for opening-round action. On Friday, March 1, the Eagles will take on Wittenberg University in a 5:30 p.m. start followed by host Guilford matching up against Sewanee. The two winners advance to Saturday's second round with that affair tipping at 7 p.m. Learn more about their first-round match-up and their UAA championship victory. The Emory women's basketball team will be travelling to Crestview Hills, Kentucky, and the campus of Thomas More University for the opening rounds of the women’s NCAA D-III Tournament. The Eagles, 19-6 on the season, will battle Trine University (25-2) of the Michigan Intercollegiate Athletic Association in first-round action on Friday, March 1, at 5 p.m. If victorious, they will advance to the second-round game on Saturday at 6:30 p.m. The Eagles team of head coach Misha Jackson were one of 21 programs to receive an at-large bid to the postseason after compiling a regular-season ledger of 19-6 including a 10-4 effort in the league that was good for a second-place tie. The Emory women’s team will be making its fourth-ever trip and first since 2013 to the NCAA Tournament. Watch video of the moment the Eagles learned they would get to compete in the championship tournament.